New Launch from IT Cosmetics -- Special Price on QVC TODAY only! I love IT Cosmetics. I have been a fan since I tried my very first product -- Celebration Foundation -- and I cannot get enough of their brushes. 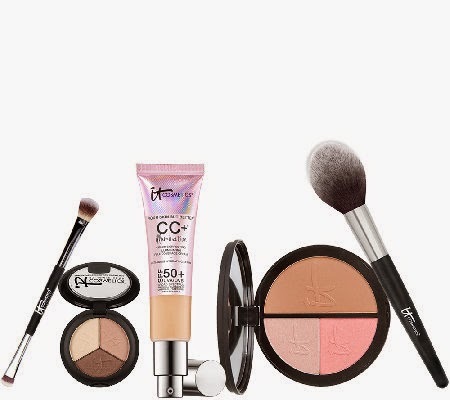 Earlier this week, the beautiful folks over at IT Cosmetics sent me the new CC+ Your Way to Radiant Skin Five Piece Collection. It launches TODAY on QVC at a stellar price! It is on QVC as I write this, so go check it out! Times on the air today are 12am, 9am, 2pm and 9pm (EDT). I was so excited to see how gorgeous the boxed collection is -- it really is perfect for gift giving. I will be back next week with reviews after I have had a chance to try everything out, but the two products of the 5 I have tried are fabulous. What is in the Today's Special Value? This collection has a retail value of $172 and with the special is less than $60! Did I mention that this is on EASY PAY? Check it out. You won't be disappointed in the quality of IT Cosmetics by Jamie Kern. *Disclosure: I received the collection at no cost for possible mention on the blog.